Special Adviser on the Responsibility to Protect Edward Luck. The deadly violence in Syria threatens to permanently divide the country along sectarian and ethnic lines, a senior United Nations official warns, urging community and religious leaders and civil society groups to lead the way in reducing communal tensions. Edward Luck, the Secretary-General’s Special Adviser on the Responsibility to Protect, told the UN News Centre yesterday that he was deeply concerned that the situation in Syria – where thousands of people have died in the Government’s crackdown against a pro-democracy uprising – was becoming “more of a sectarian conflict,” with targeted attacks against certain groups. 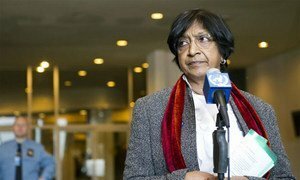 Yesterday, the UN High Commissioner for Human Rights Navi Pillay briefed the General Assembly on the latest developments in Syria, and urged the world to take action to protect the civilian population. “The longer the international community fails to take action, the more the civilian population will suffer from countless atrocities committed against them,” she said. Mr. Luck said the mixed composition of Syria’s population increased the potential risk of divisions. Mr. Luck called on the international community, including the UN and regional organizations such as the League of Arab States, to speak with one consistent and strong voice on the need to reduce sectarian tensions. The Special Adviser also underscored the importance of the role played by “thought leaders, religious leaders, civil society leaders” in steering the public debate away from sectarian attacks and towards co-existence. Media reports indicate that the Arab League has called for a joint UN-Arab peacekeeping mission to resolve the crisis in Syria. Mr. Luck said that if this plan is implemented, it is critical to ensure that any mandate explicitly refers to reducing sectarian and ethnic tensions and improving community relations.